Advances in Heterocyclic Chemistry is the definitive series in this area—one of great importance to organic chemists, polymer chemists and many biological scientists. As biology and organic chemistry increasingly intersect, the nomenclature of organic chemistry is increasingly used in explanations. 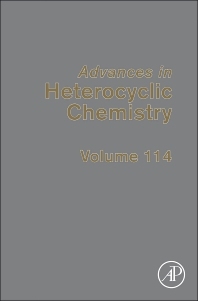 This volume, number 114, covers topics including Diels-Alder of furans for synthesis, metal carbenoids, electron-rich heterocycles, synthesis of heterocyclic natural products, viridin and Wortmannin, and dihydropyridine intermediates.